“fascinating, inspiring, uplifting” – Birdwatching with Walter M. Rosene, Sr.
Everything out of doors is fascinating, inspiring, uplifting. It has been so to me since earliest boyhood. I roamed the fields and woods, watching, wondering, and studying the things that were going on in the various realms of Nature. Everywhere there was life and action. The birds of the air, the squirrels in the tree tops – everything was moving. Even the ground seems to be moving under foot, the ants were carrying their burdens, the tumble bugs were busy rolling their huge balls and each were bound for some destination. 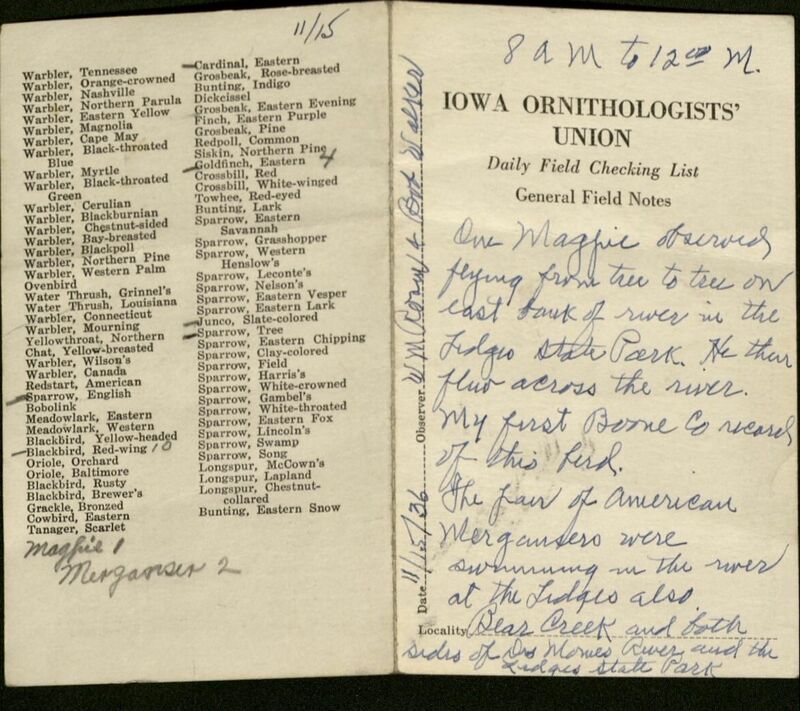 One of Iowa’s “movers and shakers” in the birding world was Walter Rosene, Sr. of Ogden, Iowa. Although a saddler and banker by trade, he was an ornithologist by avocation. Rosene was one of the first two Presidents of the Iowa Ornithologists’ Union, gave illustrated lectures on birds and birding in Iowa, and served as Director of bird-study at the American School of Wildlife Protection at McGregor (Iowa). Our earliest records of Rosene’s ornithology activities date from the 1920s, when he was in his 40s. It’s unclear when he took up the avocation, but central Iowa (Rosene’s home) has several excellent bird-watching sites. One of Rosene’s favorites was Ledges State Park, now designated by the Iowa Audubon Association as an Important Bird Area (IBA). Another favorite was Beaver Creek, where Rosene and friend Bob Walker spent seven years systematically studying a Great Horned Owl nest. From 1933-1940, Rosene and Walker kept detailed food and pellet records for the nest. Their 219 days of observation required 1156 miles by car and 53 miles on foot. They had to come up with an ingenious method for reaching the tall nest (see image at left) in order to photograph the birds, gather the pellets, and band the nestlings, of whom only six survived to adulthood. While banding the nestlings in year 6, the two adults attacked Walker and tore holes in his ears and cut the side of his head. Rosene and Walker started wearing helmets. You can find additional ornithology and bird-related collections by searching our collections here. Pages from some of Rosene’s ornithology books. We also have ornithology books in our collections, including some from Rosene’s personal library. To see any of these materials, stop by Parks 403 in the Iowa State University Library between 10 am and 4 pm Monday – Friday. We hope to see you soon! This entry was posted in Manuscript Collections and tagged birds, natural history, ornithology, photographs. Bookmark the permalink.